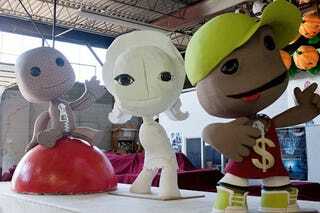 LittleBigPlanet Sackboys (and Sackgirl!) still in the making await their eventual appearance in Toronto's 2010 Santa Claus parade. Sony's a sponsor, so expect LittleBigPlanet 2 promotion in this year's festivities. Seen at Torontoist, thanks to Zack.